Screen brightness is a big deal. Playing a video game or finishing up some work on computer before bed may keep you awake long after you turn the computer off. A new study shows that the bright light of a computer screen may alter the body’s biological clock. And it can also suppress the natural production of melatonin that’s critical to the normal sleep-wake cycle. via Nighttime Computer Users May Lose Sleep. 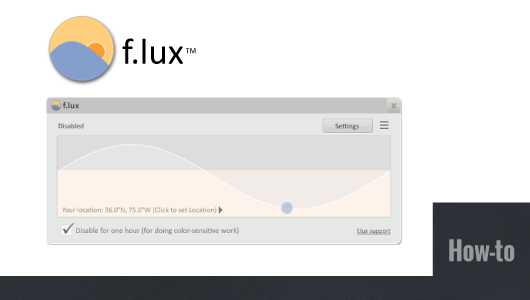 There is good news, f.lux, a free program can automatically adjust your screen brightness and color depending on the time of day. It uses your location to determine the amount of light & color to adjust. f.lux makes your screen look like the room you’re in, all the time. When the sun sets, it makes your computer look like your indoor lights. In the morning, it makes things look like sunlight again. For Windows, once installed it places an icon in the notification tray. From there you can set your location and adjust your settings. And it even allows you to disable for an hour if you are working on something that is color sensitive.